Heading to Palm Springs or Vegas? Ever wondered what lies between LA and your favorite inland destinations? 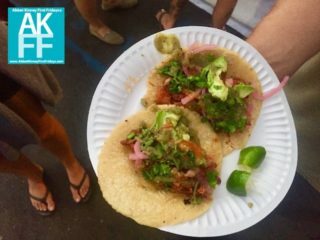 Your favorite foodie experiences and cultural indulgences have made their way 80 miles East and just a few miles off the 10. Redlands is a hub for community, art, culture and of course, food! Every Thursday, the town gathers for Market Night where over 150 vendors line the downtown street. These primarily include amazing food of all cuisines. However, you’ll also find certified farmers, local clubs and organizations, art merchants, and animal attractions for kiddos. Though you might be thinking…the Inland Empire should probably stick to growing oranges and cacti and whatever else might sprout under the desert sun. You might just change your mind! Established in the mid 1800’s, Redlands and the nearby area built itself on citrus. This prosperous fruit grew Redlands into the historical, charming town you’ll encounter today. Its State Street hosts a number of hip bars, restaurants and boutiques. And on Thursday nights, the whole town communes for a weekly food festival…Redlands style of course. Ever dream of the old-time, small-town charm you miss in the city? Well look no further. Make a stop on your way down the 10. Trust me on this one. Just West of Redlands is the town of Loma Linda, a hub for health and well being with a strong influence over its neighboring city. Healthy values are well represented at Market Night. Several street food vendors offer vegan and vegetarian options. You’ll also find fruit and veggie juices and organic foods scattered among the lines of tents. And my favorite part…you get to sample it all! No need to commit without a little taste test first. You’ll be sure to LOVE whatever you get. Our favorite vendor: Just Vegana, a Mexican, all vegan vendor attracted a line that stretched several blocks. Luckily we made our way through the crowd for a taste. And if you’re not on your health kick right now, no worries. The Cornerstone food truck will serve you fries in any way you can imagine. Oh, and its right next to the Got Rollz Ice Cream booth, to which I say, “forget the beach bod! !” This new style of dessert is served in individual rolls of thinly spread ice cream. An impressive look and taste that’s worth the wait. 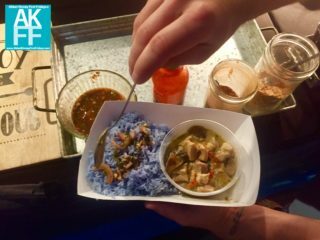 We also got to try some street green-chili curry that did not disappoint. It even came with BLUE rice…which isn’t all too different from good ol’ fashion white rice, but hey, it looked cool. And it doesn’t stop at dinner. You’ll find unique dips, organic cheese, homemade bread, hand crafted truffles and a variety of Mexican juices. It doesn’t stop at food either. Want…or, scratch that….NEED some baby succulents?? (always, maybe?) Great! They’re just a dollar! Just when you thought LA had it all…guess you haven’t made it to Redlands, CA quite yet. Just head down the 10 and maybe take an early stop to our new, favorite spot in Southern California. 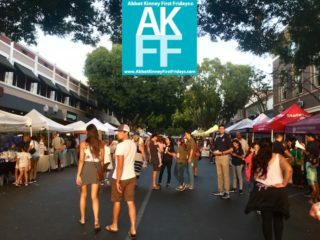 Back to School Food Truck Invasion at Abbot Kinney First Fridays!